Dresses always help you look your best. From tea to brunch to family dinner, the perfect dress makes you stand out in person and in photos. You can choose from the many options here to find a dress that will suit your needs. Browse short sleeved dresses, long sleeved dresses, minis, maxis, summer versions, and winter cuts to round out your closet. Each dress here is designed for a unique look that will be sewn just for you or your loved one. They have beautiful sleeves and necklines that flatter every body type. You can invest time in the little details on these dresses knowing that you can keep the piece for many occasions to come. This dress is perfect for bright summer days. The sleeves are fitted, like the rest of the dress. This is a great body conscious option that is neither too tight nor too short. This dress is another summer favorite. Who doesn’t love the simplicity of short sleeves with an asymmetrical hem? This cut is a breezy option that is perfect for long walks on the beach. This dress is a simple cut that can handle your boldest fabric colors. It is perfect for teas and church gatherings since the neckline is a little on the high side. The hem is not too short. This dress can also handle bold fabrics. This carefree option features a simple box cut that makes moving about easy. Its hem isn’t too short and the neckline is higher, giving you visual room for statement shoes and leggings. Who doesn’t love a raglan sleeve for active days? When you’re out and about, this dress helps you don chic prints without looking overloaded. This cut is perfect for days spent shopping or just getting ice cream. This is the quintessential professional dress. You will want to check out this cut for your darker fabrics or maybe even a black professional dress. You will look slimmer in this clean cut that is form-fitting but not too tight. This dress looks amazing in bold prints. This option sports lovely short sleeves and a breezy skirt with a long slit. You will want to check this one out for summer barbecues. This is possibly the perfect work dress. Look for your neutral fabrics for this one, so that you can wear lots of statement jewelry. This slimming cut features a ribbon and a medium-length hemline. This is a fun dress for when you dress up at work, or go volunteering during the holidays. Pull out the wilder directional prints with neon colors for this one. It features a slimming twist at the waist to keep you looking professional. This beautiful dress is on the shorter side hem-wise. It features long bat wing sleeves for a sleek, sophisticated look. You will want to pull this dress on for entertaining over the holidays. Who said minis couldn’t be longer on top? This sophisticated shirt dress will help you rock a print really well. It sports a color and clean tailoring up top so that you look classy while out to brunch. The loose shift dress looks amazing in neutral prints. It sports a higher neckline and light tailoring for a breezy look. You can let your hair down with this option while you have tea at home. This strapless option is a tailored mini with a full skirt. The bust is not cut too low, but its is lower than some. This cut looks amazing in lace and can sport some color as well. This dress looks posh in neutrals. It sports a sophisticated wide neckline that balances out the mini skirt. You can wear this with statement stockings and your best necklaces for a sleek, modern look. Rock a floral print in this mini for a fun, carefree vibe. This is an optimal choice for traveling or shopping on the boardwalk. This dress also happens to look amazing with a cardigan. This dress can make a print stand out like no other. You will look like a million bucks in this tailored option with a straighter skirt that flares at the bottom. Perfect for summer family gatherings. This vibrant maxi has spaghetti straps and a ruffle around the bust. It’s just right for wearing downtown for a summer night out while you talk the hours away with friends. This is a warm-looking dress that really makes a stripe stand out. You will find the higher neckline and cap sleeve perfect for church gatherings and family lunches. This is a unique dress with an extra color peeking through the neckline and the split hem. The added details make a great focal point for those who are shorter while adding personality. This dress can handle a really unique textured fabric if you so choose. It sports a gently scooped neckline and short sleeves that are angled just right for a whimsical look. This is a beautifully draped piece that will round out your winter wardrobe. It sports larger sleeves and loose tailoring for a relaxed yet sophisticated look. This dress features a high collar and a shorter hemline. You can easily take this dress out for dinner or to a function. It covers up top nicely. This dress features a larger collar that hearkens to vintage days. It looks great with silk details on the neckline and cuffs. Perfect for school functions or professional meetings. This is the perfect dress to cozy up with in the winter. It features an easy cut that has the comfort of your favorite tee shirt. This day dress is possibly the quintessential student dress, but it might be the perfect about-town dress also. Try it in polka dots for a chic look. This beauty features a wrapped hem and a straight neckline to balance it out. Possibly the most wearable dress for summer-it goes virtually everywhere. This outstanding piece requires matched pieces of fabric, but it’s worth it. You can sport this dress everywhere from the boardwalk to church. This is a great piece to use that bordered fabric up on. It features larger sleeves and a deep V neckline, but it looks so sophisticated! Try it for that museum trip or to book club. Everyone loves a good lace dress. This chic version sews up amazing in white, but it’s not limited to that. You can try a large or small lace with this one. This is a classic shape that looks great in brights but works for neutrals too. You can wear this one everywhere, from the library to luncheon. 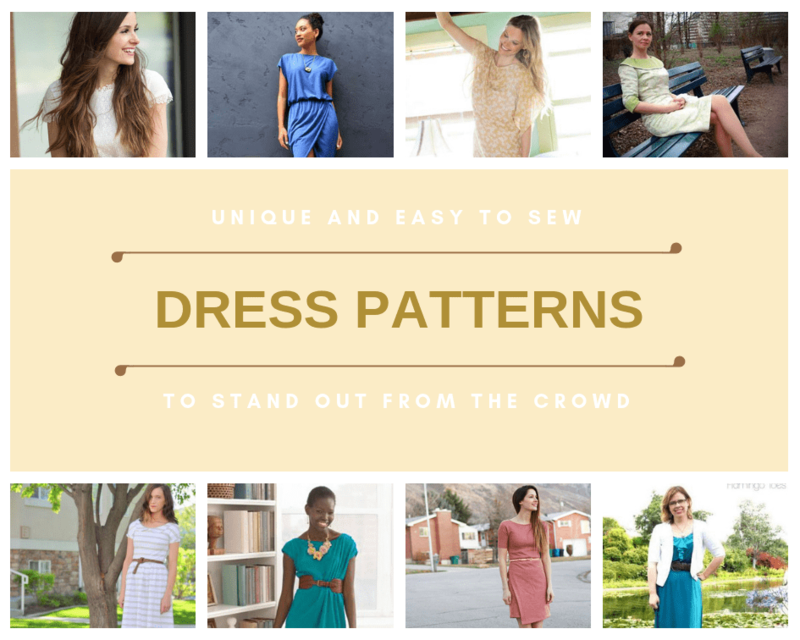 There you have them – a collection with the most interesting FREE dress sewing patterns for beginner sewists! Let us know which dress or dresses you like most.